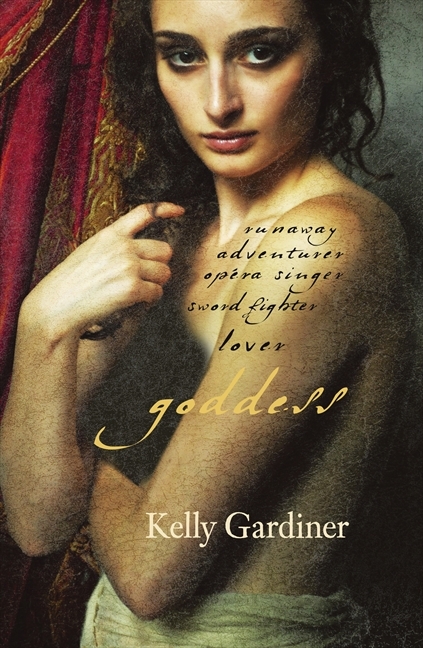 Goddess is a novel based on the life of the remarkable Julie d’Aubigny, known as Mademoiselle de Maupin – swordswoman, opera singer, occasional nun and seventeenth century superstar. She grew up in the Sun King’s Versailles, was the lover of powerful men – and women, and became the darling of Paris and Brussels, famous for her duels and breeches and escapades. After her death she was turned into an icon of infamy, of Romanticism, of decadence or courage. She has been immortalised on page and screen – even a ballet – and more recently dubbed “Badass of the Week” online. You can hear me talk more about Julie and Goddess in this interview on NPR. Here are my answers to frequent questions about Julie and Goddess. “Such scenes sparkle with period details and sensory impressions: all spectacle and shimmer, all gesture and pose, Baroque mask and mirror and role-play. Gardiner does this very well. Goddess is published in paperback and ebook formats by Fourth Estate (HarperCollins). It’s available in paperback now in the UK, Australia and New Zealand, and the US. The ebook is now available worldwide through the usual platforms. Find out where to buy a copy here. Read more about Julie d’Aubigny’s real life here. Ms. Gardiner, I have to express my deepest admiration and respect for the work you have crafted in Goddess. When I first heard of La Maupin’s story I thought it might be a story I could tell – but after a quick Google search and the purchase of your book, I felt I could not do a better job. Thank you for your loving attention to such a spectacular figure, and for the skill in your craft that animated such a fascinating woman. Thank you so much for taking the time to write such kind words. I’m so glad you found so much to enjoy in my version of La Maupin’s life.